The ratio of the length of rode to the water depth is known as the scope. Anchoring with sufficient scope brings the direction of strain close to parallel with the seabed. In general the longer your rode the better. 10:1 Scope is preferable in windy conditions. 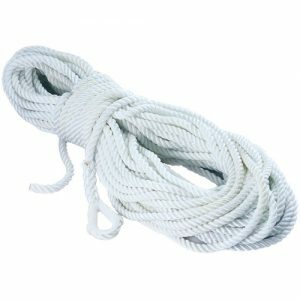 It’s recommended that an average cruising boat carries at least 400 feet of Rode, which will allow for 10:1 scope in 25 feet of water (5 feet allotted for freeboard height). This will ensure that most of the time you can anchor with 10:1 Scope. If sizing for stainless steel chain use a forged SS shackle that is one size bigger than your chain.